Everyone needs a sanctuary, but what happens when there is no longer a place for refuge? Set along the northeastern shores of Lake Michigan,The Other Side of Sanctuary is the story of a young family in crisis and the spooling tensions that arise as a dark series of events unfolds. Laura Warner leaves her troubled home in Wisconsin home after high school and arrives in the village of Sanctuary searching for a new life. There she spies Rob Sanders out on his paddle board struggling to find a way forward. Drawn together, alone at the water's edge, the two forge an instant bond. Soon she gets pregnant.They get married and have the baby. Two more children, a girl and a boy, roll in one after the other like the waves. But in contrast to the scenic beauty of their small beach town that fills with summer tourists, Laura and Rob grapple with a failing business and a dying love. Nothing prepares them for the tragic accident that follows and the harsh revelations that cast them adrift. Laura and Rob search for answers, unaware they’re traveling toward a collision that will either shatter or save their vulnerable family—or maybe, both. WELCOME TO THE HOME PAGE OF FICTION WRITER AND JOURNALIST CHERYL CRABB. STAY TUNED FOR MORE INFORMATION ABOUT THE OTHER SIDE OF SANCTUARY, COMING OUT IN JANUARY 2020 FROM ADELAIDE BOOKS! Here's a link to DWW's Write,Speak, Poetry event where you can hear an excerpt of me reading from the forthcoming novel The Other Side of Sanctuary. CHERYL CRABB is a fiction writer and accomplished journalist. 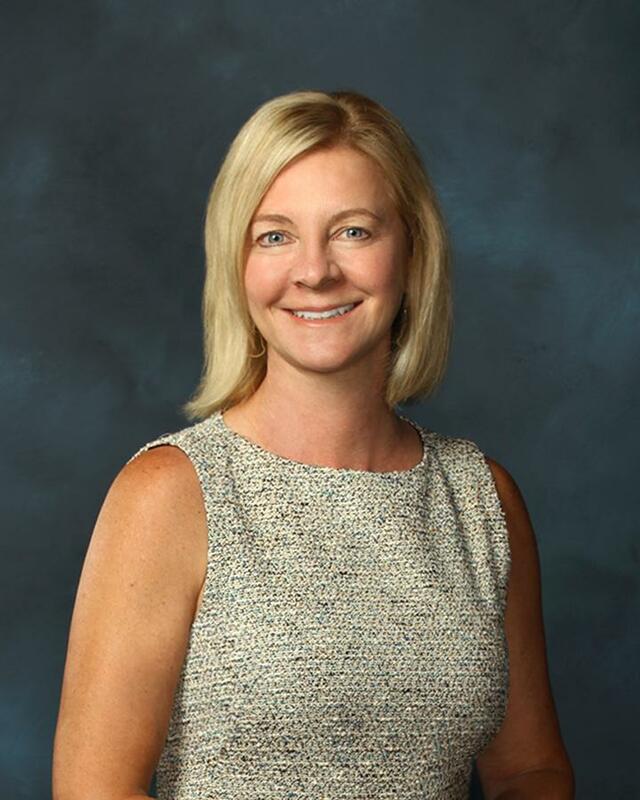 She's worked as staff writer for the Atlanta Journal-Constitution and as a regular contributor to The Hartford Courant. Crabb is member of Detroit Working Writers and the Association of Writers & Writing Programs (AWP). A Wisconsin native, she and her husband live in metro Detroit with their three daughters and frequently visit northern Michigan.The Other Side of Sanctuary is her debut novel. 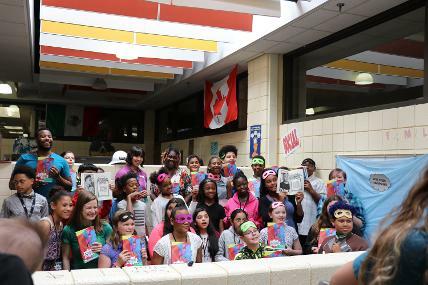 Fans of children's literature, the second and fourth grade students at Erickson Elementary in Ypsilanti, Mich., have done a lot of hard work this fall with the help of a wonderful workshop leader from 826michigan, David Hutcheson. They can't wait to show you all they've accomplished with the power of words and imagination, and a little support from community volunteers. Book release party date in Winter 2019 to be announced soon! 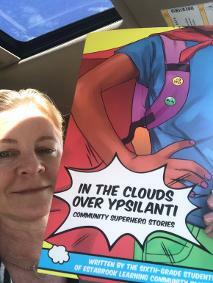 So proud of the sixth-grade students at Estabrook Elementary in Ypsilanti, Mich., who wrote fictional super hero stories along with articles about real life super heroes in the community. I enjoyed volunteering to help the students share their stories with skill and confidence. The book, produced through 826michigan, is now available at their Robot Factory in Ann Arbor. Purchases support the writing programs of the non-profit organization which inspires school-aged students with learning opportunities such as the Young Authors Book Project. 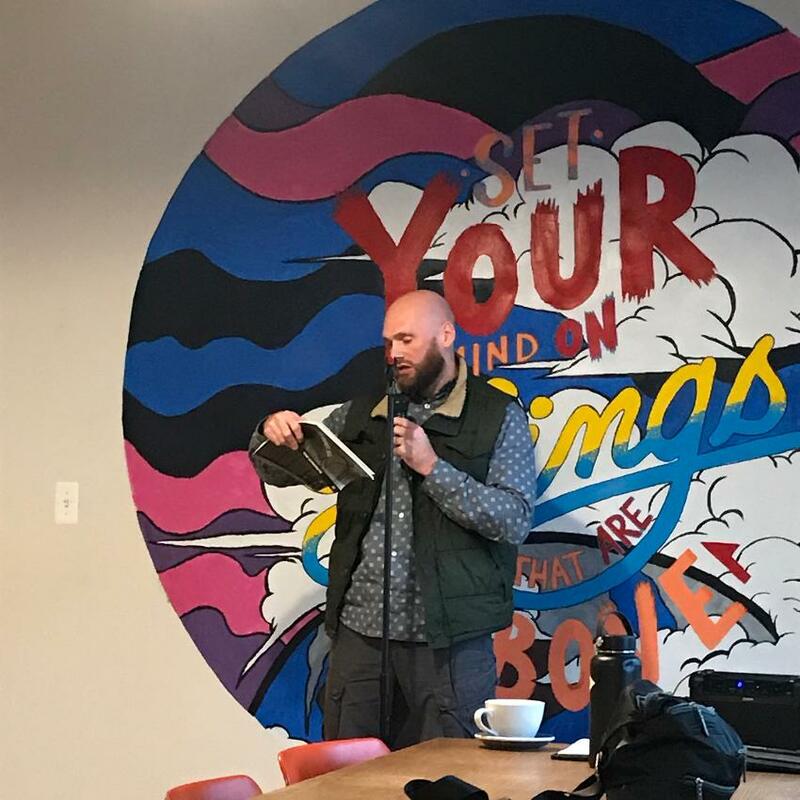 Grand Rapids author and VCFA alum, Daniel Abbott, joined in Detroit's East Side Reading Series, coordinated by Aubri K. Adkins. Abbott read from his new novel The Concrete, a gritty urban tale centered around a foster family in an entangled community plagued with violence while trying to confront the past and strive in various ways for a better life. Jesse M. Davila, another VCFA alum, also joined Daniel as one of the fascinating lineup of readers in November. Earlier readings in 2018 included: Michigan poet Cal Freeman, Ohio poet Lee Chilcote and Michigan fiction writers Jenifer Smythe DeBellis, and Dorene O' Brien among several others. [VCFA Faculty Chair Ellen Lesser (left) and I celebrate after graduation ceremony July 5, 2017 (Left) My earlier reading with VCFA at The Coburn School as part of the Association of Writers & Writing Programs (AWP) Conference in Los Angeles. OLD STORIES AT THE CORE OF HUMANITY? “Once Dolores was in my head, I couldn’t stop,” author Wally Lamb told students this morning at an informal lecture at VCFA. The idea of writing came to him at 13, Lamb said, when I read three books: Animal Farm, The Red Pony, and To Kill a Mockingbird. Of Mockingbird Lamb said, “it starts out a little slow, but then picks up when the kid’s life” is known. The first person coming-of-age story opened the door for me, Lamb said. Lamb responded that he wanted to write books that people would want to read voluntarily. “Gladys made a face like she was sucking on a lemon,” Lamb recalled with a chuckle. At that point in his life, Lamb began reading great old works—stories that people are told over and over. Lamb read the myths of the world and looked for common themes, which serve as the spine of his stories. He referenced The King and the Corpse (Heinrich Zimmer} among others. Homer’s The Odyssey was of the “guiding force” behind She’s Come Undone. The character of Dolores is comfortable but confined before she gets out in the world and does battle with it, he said. She undergoes suffering and changes. By the end, it’s a matter of whether that journey has been worth it, what has she learned, what found? Does she get something she needs? A Hindu myth is the spine of I Know This Much is True, (which will soon be a series on HBO, Lamb noted afterward in a personal conversation). In conclusion, he told students. VCFA informal talk with Wally Lamb from July 3, 2015.